Marie Carmichael Stopes met Robert Falcon Scott at an Antarctic expedition fundraiser in 1904. She asked to go with him but he declined, and the Terra Nova Expedition took place without her. Instead she gave him a crash course in paleobotany. Stopes impressed on Scott the value of Glossopteris (fern) fossils in proving Eduard Suess’s theory of the supercontinents Gondwanaland and Pangea. Scott’s party perished in March of 1912 from exposure and malnutrition. Once lionised by the British for his team’s heroic efforts, Scott’s leadership and culpability have come under scrutiny in recent years. Eight months after they died a search party discovered the frozen bodies of Scott and his two remaining compatriots, just 11 miles from the supply depot. In their tent was 30 pounds of rock containing Glossopteris fossils. 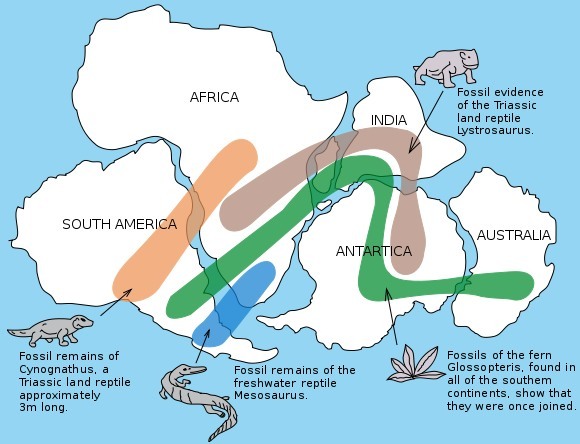 The artifacts provided strong empirical evidence for the theory of continental drift, establishing that the same fern species was once present in Antarctica—as well as South America, Africa, India, and Australia—because the land masses were at one time interconnected. Elizabeth Truswell recounted the story of Stopes and Scott on the Australian radio program Ockham’s Razor in 2011. Sister program The Science Show today celebrates its 39th birthday, re-running Truswell’s tale, and leading us to wonder about the poignant mix of scientific curiosity and human devotion that, whatever the personal failings of its subjects, uncovered the astonishing truth of Gondwana for later generations.